Dry roast the ingredients listed under to roast and grind for the spice powder till golden brown. Then grind it to a semi fine powder, set aside. Choose baby brinjals, rinse them once. 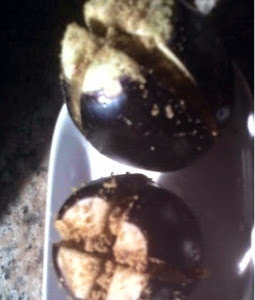 Put a plus mark in each brinjal then stuff the spice powder into the plus marks. Repeat this for all the brinjals. Reserve the remaining spice powder for the curry. 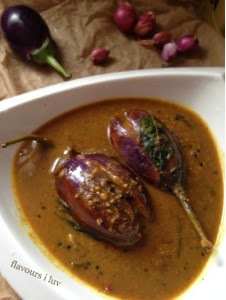 In a pan heat oil, splutter mustard seeds then add small onions, curry leaves, garlic and hing. Then add stuffed brinjals and saute till it shrinks. Then add the tamarind extract, required salt and allow it to boil for 5 minutes. Add the spice powder, turmeric and sambar powder. Add more water if it becomes thick. Allow it to boil for 5-8 minutes or until it reaches the desired consistency and oil separates.